1.Boil the corn in water, once cooked drain water and keep aside. 2.Heat oil in a kadhai. Add cumin seeds, when it starts crackling, Add ginger garlic paste and cook for 2-3 minutes.add chopped onions and cook till golden brown. 3.Add chopped onions and cook till golden brown Then add red chili powder, cumin powder, coriander powder and turmeric powder. Stir fry for a minute. 4.Add chopped tomatoes and cook till oil leaves the masala, continuously keep stirring. 5.Add mawa and half cup of water and mix and cook for a minute. 6.Add diced capsicum and mix well. Finally add boiled corn, garam masala powder and salt. Mix and cook on low fire for 4-5 minutes. 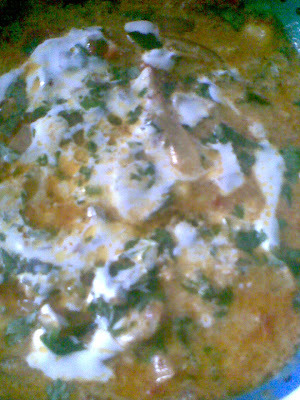 7.Stir in cream and chopped coriander and serve hot. Tips To reduce the calories, reduce the mawa and cream. Use a little milk instead. Yasmeen has tagged me with a poem on friendship.Thankyou yasmeen. "What is a friend? A single soul dwelling in two bodies". Aristotle. A unique blend of affection, loyalty, love, respect, trust and loads of fun is perhaps what describes the true meaning of friendship between two individuals. Similar interests, mutual respect and strong attachment with each other are what friends share between each other. For me Friendship means Friendship is the comfort, the inexpressible comfort of feeling safe with a person having neither to weigh thoughts nor measure words, but pouring all right out just as they are… To experience what is friendship, one must have true friends, who are indeed rare treasure.Read my article about friendship &poem here. The curry looks masaledaar with good serving of vegetables. Hi, corn masala sounds yummy! will definitely try out. Thank you sireesha, priti,anjum, kitchenflavour, yasmeen and dershana for sweet comments. Happy Ganesh chathurthi to all of you.